In the 14 years we've been married, my husband and I have only searched for a church home one time. It was during our seminary years, when we were first married and he had not yet become a pastor. After that season, he was hired by a church and then, 8 years later, we started one, so we've experienced church a little differently than most. But I will never forget being a visitor and, honestly, the experience has shaped almost everything I do in our current church. As a visitor, I remember being nervous and uncertain, but mostly I remember being eager--eager to find our "family", make friends, hear the Word preached clearly and powerfully, eager to worship, and eager to belong. When we weren't spoken to Sunday after Sunday, our eagerness deflated quickly. It still makes me feel uncertain when I think about it. Until you are new, until you're a visitor, it's difficult to understand what it's like and to put yourself in a visitor's shoes at your church, but it's so important to try. A warm, welcome, and helpful environment is one of the most essential ingredients for a person to become a follower of Christ and grow and connect within the church. "It is the first day of Bible study. I am in a new town and have had a hard time making new friends. I have looked forward to today, to an opportunity to meet some sisters in Christ, hoping to find My People in the midst of a storm. Please make me feel welcome. I come to the steps of the church. I have a child on each side, and a stroller. You all say hello, then watch as I try to lift the stroller up the stairs. Please help me. I am in a new place. I don’t know where to go and don’t see any signs for where to bring my children. Please direct me. After dropping off my children, I meekly walk back toward the main entrance. I don’t see any signs directing me where to go. Good! There are some moms behind me! I will wait for them, smile, and ask if I can go with them. I try to make eye contact. They continue with their laughter and conversation and walk around me. Please just say hello. I finally find the sanctuary, yet I don’t feel safe. I see all these sisters in Christ. But they all seem to know each other, and are not interested--or at least don’t seem to be interested--in making a new friend. Please help me find a place. I bow my head and pray. I ask the Lord for the strength to get through the morning, and that I will now respond to others the way I wish someone had responded to me. Please, Lord, let me feel your presence when I feel so alone. Let me find my place at Your feet. I see a friend, the one person who has reached out. She smiles and makes room. Thank you for being like Christ and showing love." My sweet friend is in a time of transition, as are many people at the start of this new school year. 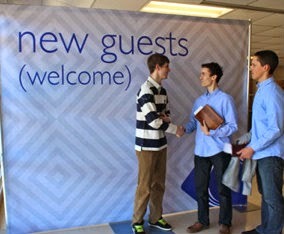 We will all more than likely encounter someone new in our churches and our neighborhoods this very week. Let's ask God to give us eyes to see the outsider, the new person, the lonely. Let's push through the awkward and interact with them. Something as simple as a helping hand or a warm welcome can show them the love of Christ and invite them into a community of believers. We may even have the opportunity to introduce them to Christ Himself.